You can choose another singer or musician to join me for your ceremony or drinks reception music. Adding another singer or musician will give a much fuller sound for your chosen music. Heavenly harmonies, intricate guitar and beautiful instrumentals will certainly enhance the soundtrack to your day! Sabrina began playing piano at a young age which later resulted in her interest in the concert flute. 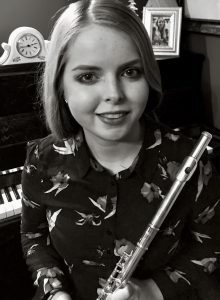 She was principal flautist and Piccolo player with the Athenry Music School Orchestra from 2009-2014. and returned to the orchestra last year for a National Concert Hall performance. She is resident pianist in St Patricks’s Church, Moylough since 2011 performs regularly with the choir on both flute and piano. Sabrina has a keen interest in many genres of music including classical, folk and musical theatre. Sabrina playing one of her self composed pieces on the piano. Rory is a self taught guitarist. He began playing and singing at a young age and hasn’t stopped since. 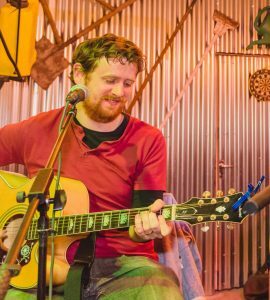 Gigging regularly in a number of bands Rory is well experienced playing to both crowds in pubs and guests at corporate events and weddings. He is a beautiful solo singer but he’s also great at harmonising and back up vocals. Rory plays everything and anything, but he loves the greats like Bob Dylan, Eric Clapton and Tom Petty. Rebecca is a classically trained singer with an amazing range of vocal techniques. 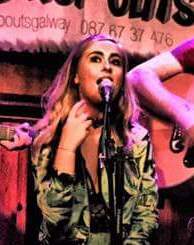 Through out her years of lessons Rebecca has completed all grades and is now a qualified vocal coach certified by the Royal Irish Academy of Music. Rebecca regularly gigs with her band “The Dropouts” and takes on songs such as crackers by Tina Turner, Prince, Sia and ACDC and always has an ear for a harmony when singing back up. Check out Rebecca’s Soundcloud here. If you’d like to include either Rory, Rebecca or Sabrina for your wedding music email ailishsarah@gmail.com to check their availability. Ailish sang for our wedding last Saturday. From the moment i first contacted her until the last song on the day she was truly amazing. Ailish learned songs for us and had no problem doing so. Our guests were amazed at her voice and ability to deliver both modern and folk songs with such beauty. Definitely a five star review. Keep up the good work. Thank you Ailish for singing at our wedding on Friday 27th July in Kenmare, Co. Kerry. Not only did I have goosebumps from the nerves of walking up the aisle, hearing your voice was just sensational. We have had so many compliments about the song choices that you helped us with and the delivery of the songs, some of which weren't the easiest to sing. Even our priest was dishing out the compliments as he said he was nervous as he had never had you at a wedding and hoped that you were as good as i had told him. My personal favourite songs were 'This I Promise You' and 'Grace'. And of course the holy songs....even the one I couldn't be bothered to choose so you chose for me sounded unreal! I cannot recommend Ailish enough, if you think the FB videos are good, well you will be mesmerised by the real thing as it's so much better!!!! Ailish sang during our wedding ceremony in April and the music was just fantastic! She has a beautiful voice and even learned an instrumental piece to play during the ceremony that was special to me! From start to finish Ailish was an absolute dream to deal with; so friendly, quick to respond, very helpful with song selection from a great repertoire and absolutely nothing is a problem. I absolutely adored the music during our ceremony and I felt it added so much to the atmosphere in the church. So many people came up to me afterwards and complimented Ailishs singing and music! Ailish, I absolutely cannot say thank you enough! Like everyone else who has a big day out, there's alot to do in the days and weeks beforehand and Ailish just did her thing and did an amazing job on the day. All we needed to do was agree on the songs we preferred from her setlist. That was it! A true pro. Ailish is absolutely amazing our guests couldn't believe her voice she was a pleasure to deal with very easy going but got everything sorted for us. Extremely easy to contact. I would recommend her to anyone for any occasion! A big thank you Ailish for singing at our wedding. From the moment i rang Ailish she was a joy to deal with. She met us and listened to what we wanted and even gave us some suggestions. In the end we picked songs she didnt know and this was no problem she learnt the songs and sounded as if she knew them forever. So many commented on her voice is truely one to be heard. My hubby told me she even helped the boys put the flowers on the suits and i think without her i dont think they would have gotten them on!! We also asked Ailish to play at the reception and this was fantastic i was allowed pick every song and my guests loved her! I would highly recommend her to be apart of what is the most important day of your life!! Dee and Shane 16th sept 2016! I wanted to write and say thank you so much for being a part of our wedding ceremony. You have such an amazing voice and being able to choose our own songs made it so personal to us. Not only did you learn new songs for us but you delivered them so effortlessly. You were a joy to work with and you made it such a wonderful day for us. Since the wedding we have received so many compliments from our friends on how beautifully you sang on our wedding day so I will be recommending you to all the brides and grooms to be that I meet. Ailish was our wedding singer & we were thrilled to have her. Ailish is a very talented singer & musician & her voice is AMAZING - Ailish sang every song so beautifully. So many guests at our wedding have commented on how beautifully Ailish sang & loved her song choices. Would highly recommend Ailish to anyone looking for a wedding singer! Thank you so much Ailish! Ailish is a qualified, professional singer available for wedding ceremonies and drinks receptions. Theme: Illdy. © Copyright 2018 Ailish Sarah Flaherty. All Rights Reserved.